You’ve heard the story of how duct tape saved Apollo 13*, but that’s not the only time tape has come to the rescue in space. Here are some of the ridiculously cool ways tape makes life far, far better in low Earth orbit and beyond. First Things First: Which Tape Is Best? Duct tape, right? Not so fast. Even when an astronaut knows the solution to their problem is tape, the question remains: which tape should they use? Two types of tape are especially common in astronauts’ toolboxes. The first is grey tape, which is just astronaut-lingo for duct tape. The second is Kapton tape (aka polyimide tape), which is basically electrical tape but better. You can find either type of tape for sale at hardware stores here on Earth, but the tapes that astronauts bring to space are tested extensively to ensure they don’t produce any off-gases (problematic, if you’re in an enclosed space), or degrade in the harsh exterior of the habitat. With that, here are some of the crazier ways tape has kept life moving smoothly in space. NASA’s Skylab space station had a special gridded floor that allowed astronauts to lock in with cleated shoes. The system kept astronauts anchored in place, letting them stay stable without floating away. But the cleated shoes didn’t always live up to the structural demands the astronauts placed on them (imagine the astronaut-equivalent of breaking the spike off a pair of killer heels on date night). But with a few wraps of grey tape, the cleats could be reaffixed to the shoes, freeing the astronauts to work on more interesting microgravity experiments. When astronaut Edward H. White II first stepped outside his craft during the Gemini-Titan 4 spaceflight, he became the first American spacewalker. To keep his equipment as tidy and non-distracting as possible, his 25-foot umbilical line and his 23-foot tether were joined into a single looping cord by wrapping them in golden Kapton tape. Everything floats in space, which kind of obviates the need for large, flat surfaces like tables. Astronauts on the International Space Station make tables useful again with built-in straps used to tuck objects against the table, but also by harnessing the joy of tape. The tape can be flipped around to be sticky-side-out and held to the table with scraps of grey tape (like the strip holding the spoon in the photograph), or with tidy squares of double-sided tape (like the squares holding the wipes and bottle). Alas, it does limit the options on setting a fancy table to celebrate the holidays. One of my favorite uses for tape on the ISS is the way astronauts use it to hold things in place that already have specially-designed mechanics to keep them in place. Case in point? During the second spacewalk of the STS 121 mission, astronaut Piers Seller’s emergency jetpack tried to escape after the latches popped open. When he was safely back in the station, he asked mission control, “Right now, is there some kind of tape fix that you guys could think about that would be helpful?” They did: his companions liberally applied Kapton tape to keep the latches firmly closed before he headed out the hatch on the third spacewalk a few days later. They’d picked Kapton over grey tape for its smoother surface, so it would slip instead of catch if he bumped into anything, but the mechanically stronger grey tape may have been a better pick since his spacewalk-buddy Michael Fossum needed to repeatedly re-secure the tape. 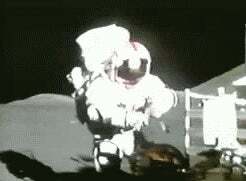 He didn’t earn the award: his repair job worked for the remainder of the first EVA, but later failed. With only half a fender to keep it contained, fine lunar dust was thrown up in clouds, sticking to spacesuits, abrading visors, and impeding visibility. The rooster tails of dust caused enough problems that the astronauts called home for help on fender-repair. 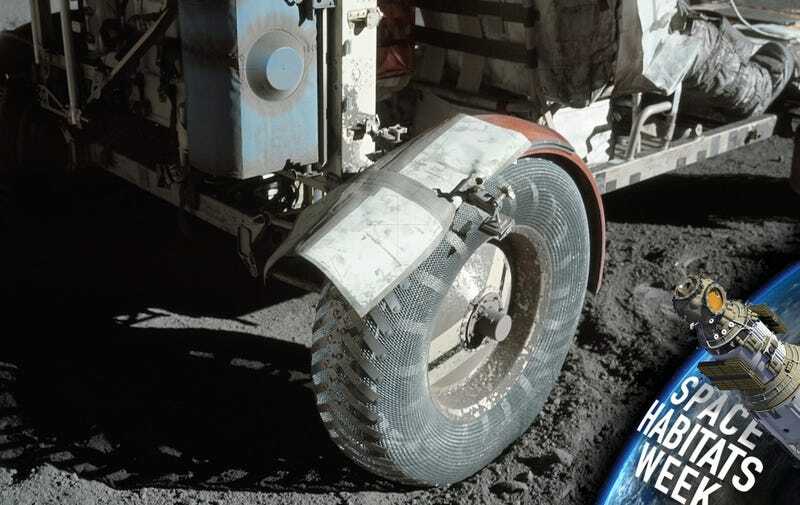 Down in Mission Control, astronaut John Young suggested repurposing a lunar map into a replacement fender, held in place with clamps from the optical alignment telescope and a liberal application of grey tape. The crew performed the MacGuyverish repair early in EVA-2, and it worked perfectly for the rest of the explorations near the taurus-Littrow landing site. Few things are as aggravating as safety gear sounding an alarm when everything is just fine. On April 24, 1998, the Regenerative Carbon Dioxide Removal System on the Space Shuttle Columbia shut down, triggering alarms and ruining any chance of sleep. After installing backup lithium hydroxide canisters to keep the air good while they worked, the crew found that a leaky check valve in the air-scrubbing system was throwing off the electronics control unit. This should’ve been a mission-ending problem, but with a one-inch piece of aluminum tape and a dash of ingenuity, astronaut Richard Searfoss removed a hose clamp and used tape to bypass the leaky valve. Forget custom, heavy, expensive insulating handles: just wrap tools in electrically-insulating Kapton tape, instead, to avoid zapping astronauts or shorting gear. The NASA archives are full of tape-wrapped tools used for extravehicular activities during construction of the International Space Station. Before NASA started 3D printing wrenches in space, grey tape was also a key component to hacking together new tools as-needed. When astronaut Stephen Robinson ventured out for the first in-orbit repair of a space shuttle, he was to pull off two pieces of filler stuck to Discovery’s belly. He was instructed to first try yanking it off with his fingers, then pliers, but if those failed, to use a hacksaw built in-orbit from a deliberately-bent blade, plastic ties, velcro, and grey tape. Tape itself can even be a tool: Astronaut Daniel Tani used Kapton tape to collect samples of worrying grit off a joint that positions the massive solar arrays powering the ISS. In 1973, the crew of Skylab 4 decided that it just wasn’t Christmas without a tree, so it built one out of empty food cans and tape. When a pipe under the Space Shuttle’s mid-deck started leaking, astronaut Dominic Gorie tried out as a plumber by wrapping the pipe in towels, then holding it all in place with duct tape. Tape isn’t just for fixing things. Sometimes, it’s an intentional, planned design feature for keeping things in place. From floating mesh in the biology experiment box to wall brackets to entire velcro-tape mounting systems, the space station relies on tape to keep just about everything from drifting where it shouldn’t. Along with all the cool tricks tape does only out in space, it also performs the same mundane functions it does here on Earth like closing bags and sealing packages. But even more importantly, it can be used to affix notes, allowing astronauts to razz each other with terrible poetry even when the backup crew is being kept far away from the launch vehicle. *What’s that? You haven’t heard it? Well. Here’s the story about how Apollo 13 astronauts used grey tape to fit a square peg in a round hole.